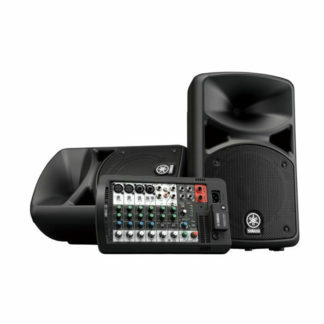 600-watt, portable PA system with 10-channel powered mixer, two 10″ speakers, Wireless Bluetooth connection, SPX digital reverbs, an onboard feedback suppressor and versatile EQ. 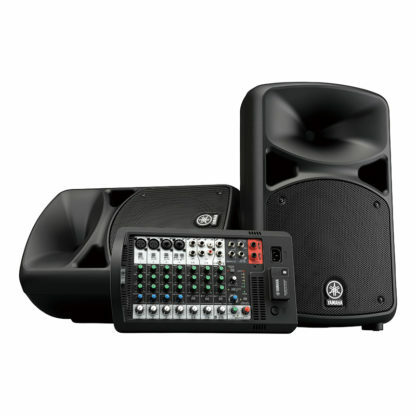 Bluetooth Wireless Audio Streaming: Equipped with a Bluetooth input for wireless audio streaming from smartphones or tablets, the STAGEPAS-BT models let you seamlessly play backing tracks for gigs, or set the tone of parties, conferences, or events with the audio playback of your choice. Flexible Connectivity: Equipped with 10 channels, the STAGEPAS 600BT offers versatile connectivity, comprehensive channel functions, and seamless expandability that meet the growing demands of a wider range of applications and environments. SPX digital reverb: One knob gives you access to four different high-quality reverb settings, perfect for vocals and acoustic instruments. Simply turn the knob to change the reverb type and time, and then you’re ready to apply just the right amount of high-resolution effect to each channel. 1-Knob Master EQ: This new function gives you instant mastery of your mix, allowing you to match your sound to your surroundings. Simply turn the knob to optimise the EQ, to the left for speaking engagements, centred for musical performances, or right just to kick in more bass; getting your sound right has never been so easy. 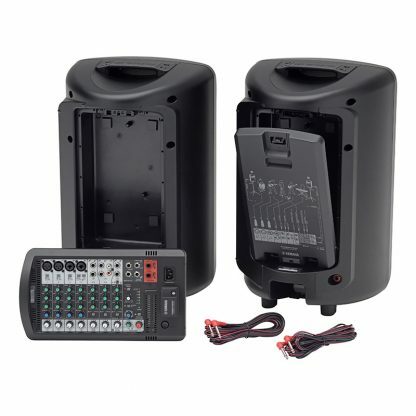 Use with Subwoofer: Add more bottom end to your system by connecting a powered subwoofer such as the Yamaha DXS Series. Simply plugging in a subwoofer will assign a high-pass filter to the STAGEPAS speakers automatically.